Northern Illinois University’s Mackenzie Roddy (San Bernardino, Calif./Cajon) was named the Mid-American Conference’s Female Scholar-Athlete of the Week, the league announced Wednesday. Roddy had a phenomenal weekend with the Huskies, as they scored wins over Eastern Michigan and Central Michigan to improve to 13-7 overall and 6-0 in the MAC. In the two matches, the San Bernardino, California, native had 47 kills (5.22 kills/set), three service aces (0.33 aces/set), six blocks (0.67 blocks/set) and 15 digs (1.67 digs/set). Friday at EMU, Roddy led the Huskies with 23 spikes (4.6 kills/set) to go along with four blocks (0.8 blocks/set) in a 3-2 victory over the Eagles. The next night in Mount Pleasant, she recorded 24 kills (6.0 kills/set) and a .429 attack percentage, in addition to three aces (0.75 aces/set) and two blocks (0.5 blocks/set) in helping lead NIU to a convincing 3-1 win over the Chippewas. A business management major, Roddy maintains a 3.94 GPA. This is the second time this season and the third time in her career that she has earned the award. Drew Hare of the NIU football team is the other Huskie student-athlete to win the award, doing so Sept. 8. 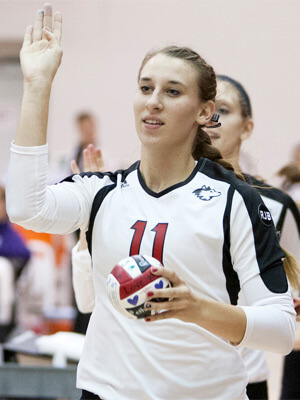 The NIU volleyball team returns home for a pair of matches this weekend. The Huskies take on Akron at 7 p.m. Friday and Buffalo at 7:30 p.m. Saturday for Alumni and Breast Cancer Awareness Night. Fans with a ticket stub from the NIU football game against Miami can get into Saturday’s match for just $2.